Replying to a vote of confidence in Parliament, the Prime Minister made a very important statement that last year 10 million people got employment. The aim of the United Nations’ Sustainable Development Goal (SDG) 8 is to ‘Promote sustained, inclusive and sustainable Economic growth, full and productive employment and decent work for all’. Target 8.10 says ‘Strengthen the capacity of domesticfinancial institutions to encourage and expand access to banking, insurance and financial services for all’.The United Nations has organized a well laid out plan in front of member countries to achieve this goal under which employment for all, economic inclusion, non-discriminatory society, creation of efficiency, availability of skilled workers and forced labor or abolition of bonded wages are prominent. To improve the efficiency of the workers for sustainable and inclusive economic progress in any country and effectively reducing the unemployment of youth; work should be done to simplify people’s access to economic resources and banking facilities. The UNO estimates that 23 million people will be displaced by the year 2019 and by the year 2030 about 60 crore people will be in search of employment. Young people’s unemployment is three times higher than the elderly and creation of appropriate opportunities for them will be a big challenge, for which efforts should be made right now. The condition in 76% of the world’s countries is that one in ten young people is neither studying nor employed. Anarchy increases in such conditions. The most important point of SDG 8 is – employment for all. With the completion of this one point, the other objectives are also likely to be completed. As far as India is concerned, due to being one of the largest populations in the world, the problem of employment is also huge, whereas the other aspect is that due to the large population, there are a considerable number of work forces that can be handled here. There is a need to create opportunities for them. The average age of the work forces is between 15 to 65 years. If people of this age group are employed in non-agricultural jobs then there is a possibility of higher earnings. Higher earnings can also mean more savings and the impact of higher savings on GDP increases the country’s growth rate. 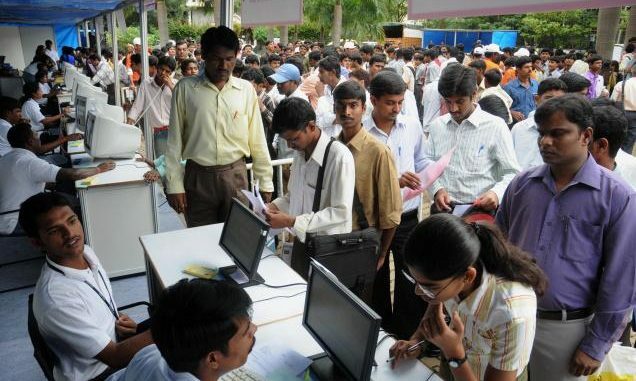 Since the year 2012, the number of unemployed youth is increasing every year between 50 to 70 lakhs and more worrisome is the fact that since the year 2012 the employment growth rate has been falling continuously. Now more educated young people are unemployed than before and they do not want to go and do hard-working jobs like farming or construction work. For them, the government has to create jobs or provide self-employment arrangements. In line with the UNO’s intention, the government has taken several steps like Kaushal Vikas Yojana, Make in India, Startup India, Digital India and Skill India in this direction, but their overall impact is yet to be assessed. The UNO talks about discrimination and women’s empowerment. The goal of equal participation of women from birth to education and employment has been given. In the Indian subcontinent, the condition of India is far behind Bangladesh. The female participation rate in the country’s workforce is only 33.1%, whereas in Bangladesh, it is 60%. In the case of men it is 82.7% in India. It is worth mentioning that about half, 48% of the country’s workforce is engaged in agriculture alone and the miserable condition of agriculture is not hidden from anyone.